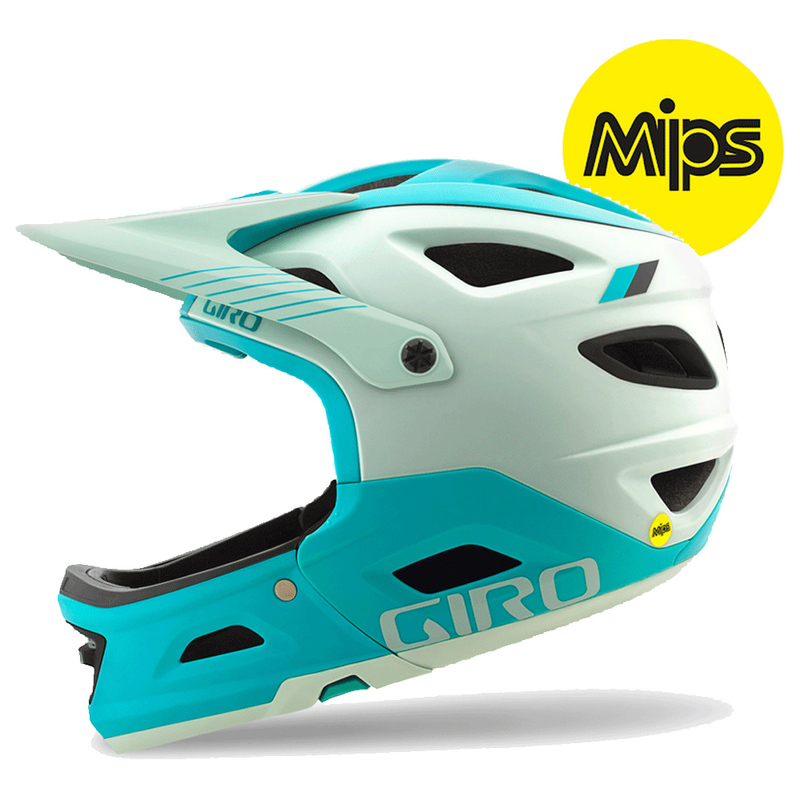 The Switchblade™ MIPS is Giro’s ASTM downhill certified full face helmet with a removable chinbar. Everything about the Switchblade is optimised for the descent, and that’s why it’s certified to CPSC, EN-1078 and ASTM-1952-DH with and without the chinbar. The chinbar is easy to remove - just push the buttons under the chinbar, rotate up, and remove—and it’s just as easy to reinstall. The Giro Switchblade MIPS features the new Roc Loc® Air DH fit system, which has a bumper around the dial to prevent accidental adjustments if your helmet contacts your backpack or neck brace—all while keeping you cool. When the chinbar comes off, Wind Tunnel cheek pad ventilation adds even more cooling power as you start to climb. Plus, the full-cut style gives this helmet an aggressive look and provides ASTM certified coverage even when the chinbar is removed. When your ride is all about descending, your helmet should be too, and the Switchblade MIPS is the only removable chinbar helmet that is truly built for the down. yet but it is a great looking helmet. Chin bar removal is easy and it feels solid when reattached. Fast shipping and quality product. Really happy! The conversion to full face and back is easy. The fit is good and the coverage protection is good. Amazing helmet, fits perfectly on my head. Great protection and well cooler. The removable chin guard is a good help when you are going up hill . Definitely recommend this helmet. Comfortable and offers good protection, even with chin bar removed. Warmer than an Enduro lid but worth the extra weight and heat for the added safety. I will probably use this helmet more in its open-face mode than full-face, so had some concerns about weight, ventilation and comfort as compared to a trail lid. Needn't have worried; it's extremely comfortable, and once moving the ventilation is excellent. As speeds and hazards increase, a bit more moto-style protection makes sense to me, and I'm old enough not to be bothered about the fashion element. Besides, I'm seeing quite a few of these in use on the trails, so they're losing their novelty look anyway. That said, I couldn't have justified the full price, but at hefty discount I'm happy. Very good quality and design. Just sizing is a lttle different than older products.